Battleship IOWA Museum hosts special exhibits on an ongoing basis. Current exhibits include a focus on aviations, Lost at Sea with Dr. Bob Ballard, extended tour experience, and a Surface Navy highlight area. These exhibits enhance our award-winning tour experience which include augmented reality, multiple decks of space, virtual reality, and a flight simulator. Ultimately, every tour aboard Batleship IOWA Museum highlights new areas not noticed before. Walk through an exhibit that shows the human impact on shipwrecks found by famous explorer Dr. Bob Ballard. Not only did he find the RMS Titantic, he is also known for locating famous wrecks such as German Battleship Bismark, troop carrier Lusitania, President John F. Kennedy’s PT-109, and American Submarine Scorpion. This special exhibit is open daily and part of the Battleship IOWA Museum extended experience. See the video documentary ‘A Tale of Two Ships’ and eight-banner display highlighting the ending weeks of the WWII Japanese destruction. The combined efforts of naval forces from the American-British-Dutch-Australian fleet in Indonesian waters resulted in the loss of over a thousand lives on the night of February 28, 1942. On this blood-strewn evening, USS Houston and HMAS Perth were sunk in fierce battle off the Island of Java. From the sinking of both ships, visitors will follow the survivors as they are forced into captivity as prisoners-of-war. Many ended up working on the Burma-Thai Railway – the ‘Death Railway’ – while others were once again shipwrecked as their Japanese transport ships were torpedoed by American submarines, unaware of their presence aboard. The fascinating exhibit examines the wrecks of both ships which remain off the coast of Indonesian sea-floor, and the preservation work of Australian and Indonesian authorities to protect them from illegal salvaging. This exhibit is on loan from the Australian National Maritime Museum, in conjunction with Pacific Battleship Center, on its tour of the United States. It highlights the ongoing friendship and alliance between our two countries and has been developed as part of ANMM’s ‘War and Peace in the Pacific 75’ commemorative program. Guardians of Sunda Strait is part of the Australian National Maritime Museum’s USA Programs and is funded by the USA Bicentennial Gift Fund. Battleship IOWA Museum Los Angeles is home to a flight simulator experience. There are six different in-flight experiences riders may choose from. Guests are able to ride the Flight Simulator with a purchase of a Combo Tour and Ride Ticket. A separate $8 ticket is available for the Flight Simulator only. The aviation story of the Battleship IOWA goes back to when the ship was commissioned in 1943. At commissioning, she was equipped with catapult-based float planes. Shortly after the end of World War II, the flight deck was modified to act as one of the first helicopter flight decks aboard a surface Navy ship. During the ship’s service in the Korean War, helicopters operated from the flight deck of IOWA for critical missions including rescuing downed pilots, forward observation, and supply replenishment. The use of helicopters onboard the battleship remained constant throughout her career, ultimately retiring for her final time in 1990. This Korean War-era Piasecki HUP Retriever is proudly displayed on the historic decks of Battleship IOWA Museum Los Angeles. 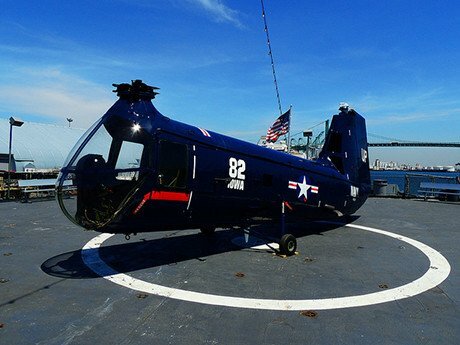 The HUP-2 is an important artifact which tells the important story of battleship-based helicopter aviation. It is a perfect addition to our public education programs, as well as a moving memorial to helicopter pilots. It is one of the last remaining HUP-2 helicopters available in the United States.